My 1-2-3 Cents : Mania Memories: Missed Opportunity? 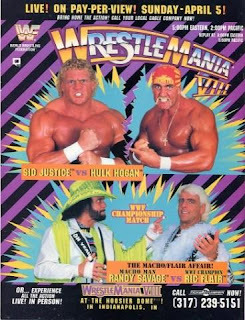 I know it's been 20 years, but I really think the WWF missed a huge opportunity with the main event of Wrestlemania 8. Ric Flair had left WCW, signed with the WWF, and won the world title in the Royal Rumble. 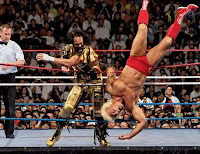 The smart money was on Flair to defend against Hulk Hogan. The two had been dominant champions of their respective companies for nearly a decade by that point. It was most fans "dream match." At first, they had announced that Hogan would get the title shot. It was during a "press conference" on WWF Superstars that President Jack Tunney made the declaration. There were five candidates for the match, including Hogan, Randy Savage, Sid Justice, the Undertaker, and Roddy Piper. Justice felt snubbed by the move, especially since he was the last man in the ring with Flair at the Rumble. This set up tension between he and Hogan and eventually lead to a change in plans. Hogan took on Sid and Flair and Savage did the title match. The reality of the situation was Savage and Flair likely put on a better match than Hogan and Flair would have. But the mark in me (yes, I was a Hulkamanic) wanted to see the two icons go at it. In fact, I had gone to a house show the previous winter in Cape Girardeau, a small town about two hours outside of St. Louis. The main event was Flair and Piper. Earlier that day in St. Louis Flair and Hogan had done battle. Rumor has it that the house show draws weren't there during the lead up to the Royal Rumble and that's why they decided not to go with Hogan and Flair at Mania. I did enjoy the build up between Flair and Savage with the doctored photos of Flair and Elizabeth. "She was mine, before she was yours" still makes me smile. Savage was out for revenge to defend the honor of his wife, while Flair played the wheelin', dealin', kiss stealin' heel to the hilt. Savage ended up getting revenge and winning his second WWF world title. Sid and Hogan meanwhile ended up being the main event. The match was being sold as Hogan's potential retirement. 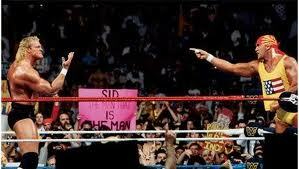 The action was what one would expect from Hogan and Sid. It ended with a disqualification, which I (and probably most fans) hated. Papa Shango of all people came down to assist Sid in his assault of Hogan, who was eventually saved by the returning Ultimate Warrior. Besides the Flair-Savage battle, the Bret Hart-Roddy Piper Intercontinental title match stole the show. Bret was clearly on his way to bigger and better things and his match with Piper was superb. It's one of the few times I can actually remember Piper's shoulders being pinned to the mat. The more I think about it, it might be the first time I actually saw it happen. Think about it, when he was a heel he was disqualified or counted out most of the time. Shawn Michaels also made his singles debut at a Wrestlemania, by beating El Matador Tito Santana. It's been interesting watching him develop along the way from the Rockers and losing to the Big Bossman and Akeem to becoming "Mr. Wrestlemania" with matches against the likes of John Cena, Kurt Angle, and the Undertaker. What are your thoughts on Wrestlemania 8? Should the WWF have gone with the Hogan-Flair match? Post your comments here and like us on Facebook.